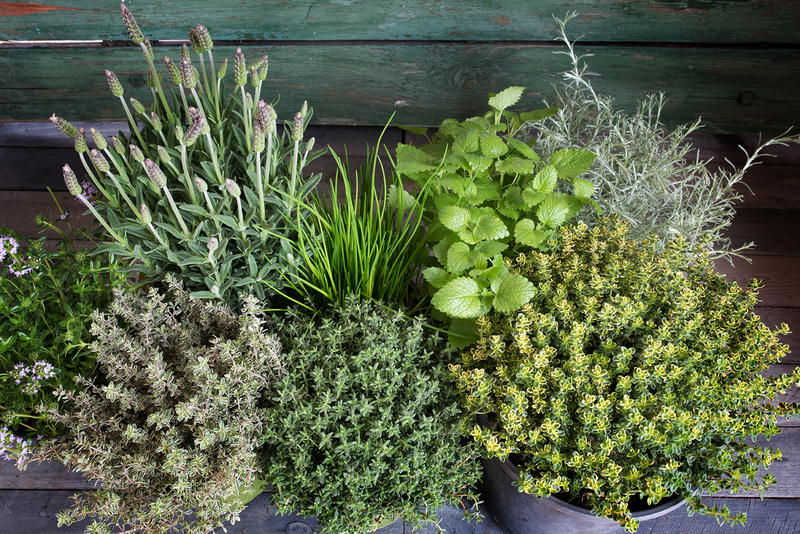 How to create your own edible outdoor herb garden. Planting and maintaining an herb garden is a fun, rewarding activity that’s perfect for anyone willing to put in a little bit of time and effort. In addition to adding beauty to your outdoor living space, your garden also has a functional purpose: You can use your herbs to garnish and add flavor to your favorite dishes—a great personal touch that can enhance any meal. Getting started is simple. Just follow the steps below! Step one: Pick your spot. Be sure to choose an area with enough space for plants to grow. If you live in a city where yard space is limited, you can use pots on a porch or balcony—just make sure they are big enough to accommodate future root growth. It’s also important to pick a location with ample sunlight, as most herbs will require at least six hours of direct light every day (although at least eight hours is ideal). Seedlings for these herbs can usually be found at your local home and garden supplier, plant nursery, or hardware store. While you’re there, you’ll probably want to pick up a small shovel, watering can, and some fertilizer (which should be used sparingly with herbs). If you’re using pots, fill them with fresh potting soil. If you’re planting directly in the ground, it’s a good idea to dig up and aerate the soil beforehand. Be sure to give your herbs plenty of space between each other when planting (at least a few inches) to allow for root growth. Dig small holes an inch or two deep and plant your seedlings carefully, making sure that root systems are completely buried. Once your herbs are in soil, moisten it with a little bit of water and add a small amount of fertilizer. If your herb garden is in an area frequented by animals like rabbits and squirrels, you may want to put up a small fence or barrier to protect it. Step four: Maintain and enjoy! Your herbs should get most of their water naturally through rainfall. But check on them every day to make sure the soil has some moisture. If the soil is cracked and dry—or if you notice the leaves on your plants starting to wilt—it’s time to water. As a general rule, when leaves can be pinched off of plants without hurting future growth, they’re ready to be used. If you started with seedlings, you can probably start harvesting your herbs about four to six weeks after planting. That leads us to the best part: using your freshly grown herbs to enhance your favorite foods. Whether it’s shredded basil on pizza, chopped chives in potato soup, or oregano leaves on fresh fish, the options are practically endless. Don’t be afraid to experiment with the culinary possibilities! If you’re looking for a worthwhile, fulfilling spring activity, look no further than planting your own outdoor herb garden. It takes some time and patience, but we promise it’s worth it. And if you’re looking for other exciting ways to enhance your home’s landscape this year, we’d love to chat! This entry was posted in At Home, Estates and tagged Featured by Eric Engledow. Bookmark this link.